This is an absolute must for every music educator! First published in 1984, this book has become the standard source book on the subject of copyright for music educators. The updated and revised second edition now addresses new technologies, with added chapters on video and computers. Also included are website addresses to help you keep current with up-to-the-minute changes in copyright law. 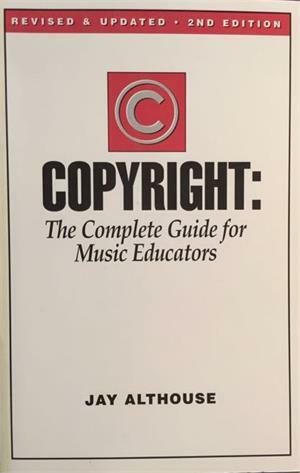 And the book still covers the questions and subjects most relevant to music educators, including: Photocopying; Recordings; Performing Rights; Arrangements and Adaptations; Fair Uses; Exclusive Rights In Copyright; Broadcasting; Performing Rights Organizations; Duration of Copyright; Penalties for Infringers and more. Written in a concise, straightforward style, without confusing legal terminology, this book is written exclusively for music educators. More than a book of dos and don'ts, this is a book of whys and why nots - a book that helps you understand copyright laws and apply them to your own situations. Highly recommended!